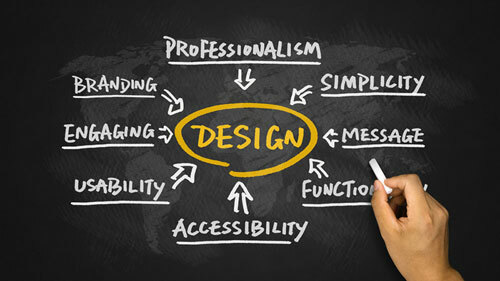 Although we agree that your website should look good, at Spencer Web Design we believe design has a deeper purpose. Designs need to grab your audience’s attention and inspire them to take action. We believe you can motivate people to explore your website using creative design. Support your business goals including sales, marketing and communication requirements. Visually present your businesses’ brand: the colors, image, style, personality and more. Be attractive to your target audience. Make it easy for readers to find the information they want. Highlight functional elements such as sign-up forms so they stand out. Help web users intuitively navigate screens on your web portal and intranet. Conform to accessibility guidelines for people with disabilities. The images, colors and page layout make up the graphic design elements of your website. These elements should work together to create a pleasing environment that engages your audience and compels them to explore your site. They should never, ever get in the way of what that visitor is trying to do or find. People visit your website for a reason. They need to be able to find what they are looking for and understand your products, services and marketing messages. Intuitive navigation helps website visitors navigate your site efficiently. They’ll find what they need without spending a lot of time figuring out where it is or more importantly, without leaving the site to go find it somewhere else. Easy to scan text that includes informative headlines, bullets and other typographical devices will help grab the attention of fast scanning website visitors. Utilizing multiple design elements including text, pictures, charts and graphs, audio and video will engage people with different learning styles. This is where website design meets web technology and programming. Your site must be functional both for your website visitor and for the web crawlers that index your site for Google, Bing, and other search engines. For best results you need high-quality programming code that won’t slow down your site or deter the robots that index the Internet. Let us help you showcase your business. Call us today at 636.922.7112.